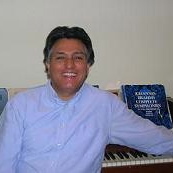 Center for Iranian Music » Reza Vali, Ph.D.
Dr Reza Vali was born in Ghazvin, Persia (Iran) in 1952. He began his music studies at the Conservatory of Music in Tehran. In 1972 he went to Austria and studied music education and composition at the Academy of Music in Vienna. After graduating from the Academy of Music, he moved to the United States and continued his studies at the University of Pittsburgh, receiving his Ph.D. in music theory and composition in 1985. Mr. Vali has been a faculty member of the School of Music at Carnegie Mellon University since 1988. He has received numerous honors and commissions, including the honor prize of the Austrian Ministry of Arts and Sciences, two Andrew W. Mellon Fellowships, commissions from the Pittsburgh Symphony Orchestra, the Boston Modern Orchestra Project, the Pittsburgh New Music Ensemble, Kronos Quartet, the Seattle Chamber Players, and the Arizona Friends of Chamber Music, as well as grants from the Pennsylvania Council on the Arts and the Pittsburgh Board of Public Education. He was selected by the Pittsburgh Cultural Trust as the Outstanding Emerging Artist for which he received the Creative Achievement Award. Vali’s orchestral compositions have been performed in the United States by the Pittsburgh Symphony, the Seattle Symphony, the Boston Modern Orchestra Project, the Baltimore Symphony, the Memphis Symphony Orchestra, and Orchestra 2001. His chamber works have received performances by Cuarteto Latinoamericano, the Pittsburgh New Music Ensemble, Kronos Quartet, the Seattle Chamber Players, and the Da Capo Chamber Players. His music has been performed in Europe, China, Chile, Mexico, Hong Kong, and Australia and is recorded on the Naxos, New Albion, MMC, Ambassador, Albany, and ABC Classics labels.